Fattoria Landrucci is a farm country estate with six spacious well-maintained apartments, shaded gardens, swimming pool, a lake at walking distance and is situated in a wonderful environment. Landrucci is also easily accessible by public transport. Apart from regular overnight stays Landrucci offers many extra facilities. For more information look under Accommodation. 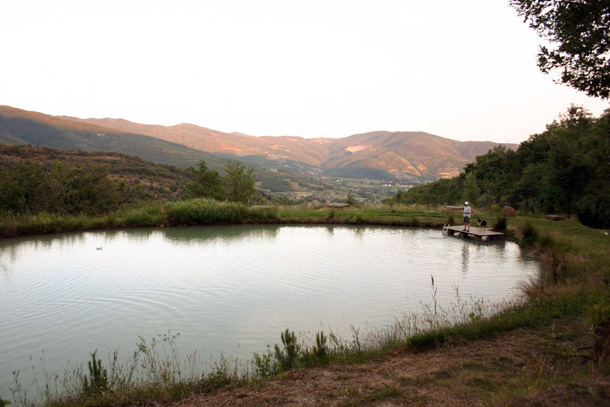 Burciano Di Sotto is a very spacious and rustic campsite at the Umbria-Tuscany border with a lake offering panoramic views of the hilly and green surroundings. The 12 big and private camping areas are spread around over 15 acres of natural terrain. Also the campsite offers extra facilities. For more information look under Accommodation.